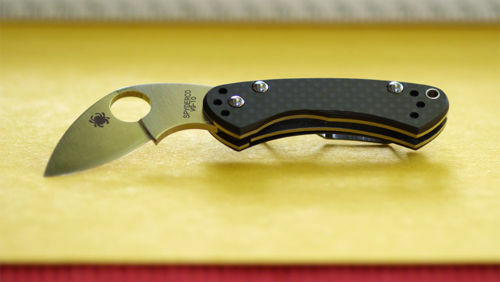 The C141 Balance is a small knife that, when closed, is symmetrical from side to side. The C141 Balance first appeared in the 2010 Mid-Year Supplement. Pictures of the prototype from the IWA show March 2010 (courtesy of Mr. Blonde, AKA Wouter). Video of the Balance as a self defense knife. Balance is a state of equilibrium or equal distribution. In our case it’s an Ed Schempp folder that is symmetrically identical on both ends when the folder is closed. Odd looks aside, when held in the hand it’s ergonomically proportional and a natural fit. The VG-10 blade is full-flat ground and arcs upward a radical curve with a deep finger choil. When the index finger is positioned in the choil, the cutting edge aligns with the forearm moving the blade’s weight back and the center of gravity toward the cutting edge where it responds like a natural extension of the hand. 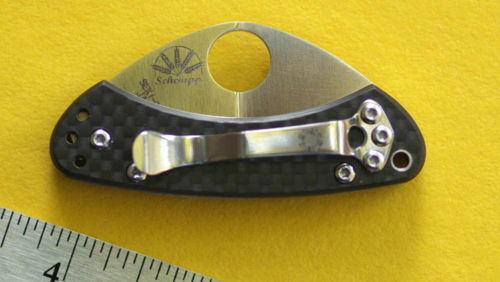 The enlarged Spyderco Round Hole is dead center on the blade when closed and perfectly off-centered when open, positioning the thumb for flowing one-hand operation, justifying the name Balance. 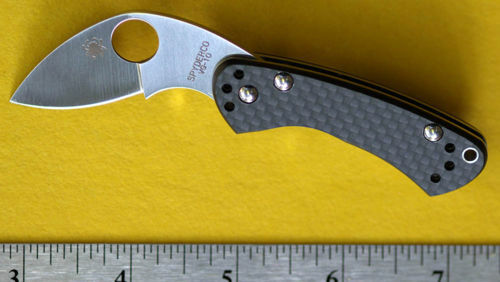 Handle scales are gray carbon fiber and assembled with screws for cleaning and adjustment. Four-way, left/right, tip-up/tip-down hourglass clip, clips discreetly in a pocket. Piped lanyard. Symphonic fit and finish. The C141 Balance is made in Seki-City, Japan. This page was last modified on 8 November 2013, at 19:47.